Agilent’s new N7744A and N7745A optical power meters with four or eight power-sensor channels provide manufacturing customers with increased throughput and operational efficiency to meet today’s challenges in manufacturing. 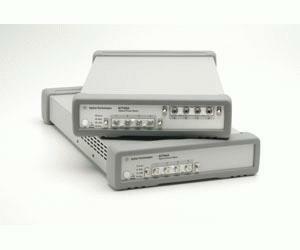 Designed for characterizing optical multiport components, these optical power meters offer industry-leading solutions for device connectivity, high-speed measurement data acquisition and fast data transfer for post-processing. The multiport power meter enables fast measurement solutions for all multiport devices; for example multiplexers, PON splitters, wavelength selective switches (WSS) and ROADMs, as well as compact setups for simultaneous testing of multiple single-port devices. With this new power meter comes the unprecedented N7740 fiber connectivity concept, which is a quadruple adapter (quad-adapter) with a snap-on quick-locking mechanism. The device to be tested can be connected to the quad-adapter in a comfortable ergonomic working position, even while the instrument is measuring another device. Then the quad-adapter can quickly be snapped on, to provide repeatably high-precision connections. Use of the quad-adapter simplifies aligning connector keys, especially for rack-mounted instruments and makes it easier to connect ports in the desired order, helping to avoid errors and connector damage.